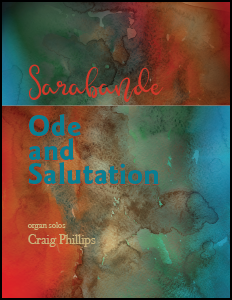 Two individual organ works by Craig Philips (“Sarabande” and “Ode and Salutation”) comprise this volume. Both pieces are dedicated in memory of organist Jonathan Biggers who was a close friend and champion of the composer. “Sarabande” is a lyric medita tion inspired by the “O Lord, support us” evening collect from the Book of Common Prayer. “Ode and Salutation” begins quietly, with solemnity; the music gradually builds to a glorious ending of resplendent affirmation.